Those with a serious thirst for statistics will be aware that Australia fielded over 993,000 men and women in uniform during World War Two, with approximately 725,000 of those serving in the Army. What most will be unaware of is the sheer number and variety of units that made up the Army in its many guises, that being the 2nd AIF, AMF, PMF etc. Graham McKenzie-Smith reveals in The Unit Guide that there were a staggering 5,700 separate units, which between them had 13,700 separate unit names, with some units undergoing up to 10 identity changes. We are now able to begin to understand the enormous challenge faced by historians, genealogists and families who attempt to locate the movements of major and minor units, and ‘where did Grandad serve’. Much has been written about campaigns, battles and the fighting units that participated in major events from 1939 to the end of hostilities in 1945. We have the official history series, just over 400 published unit histories, a number biographies of major identities, some individual stories written by veterans, as well as access to the wonderful archive that holds the War Diaries at the Australian War Memorial; however only a small selection of these are available online. So what of the thousands of minor fighting forces and the myriad of support units? Many of these have been forgotten, until now. Graham has devoted 35 years of trawling all unit War Diaries and other sources to present to the military history table one of the most important and significant works produced in the last fifty years on Australia’s involvement in the Second World War. This six volume boxed set of 3,608 pages, and over 1.6 million words fills a void that no one else has dared to tackle. In The Unit Guide we discover known details of the raising and formation of the unit, it’s role, when, what and where, operations it was involved in and where it fitted into the Order of Battle. Source material is referenced and where a unit history or war diary exists, they too are appropriately acknowledged. A common introduction at the beginning of each volume is an informative guide on how to achieve the best results from this work. The indexing and the ability to search by unit type, name or location makes this a comprehensive method to locate a single unit, or all units that served in a geographical location, both within and outside Australia; for example there are 35,000 references to 3,113 separate locations. Comprehensive cross referencing of units and locations allows the reader to broaden the search, thereby gaining a greater understanding of how a particular unit fitted into their chain of command. 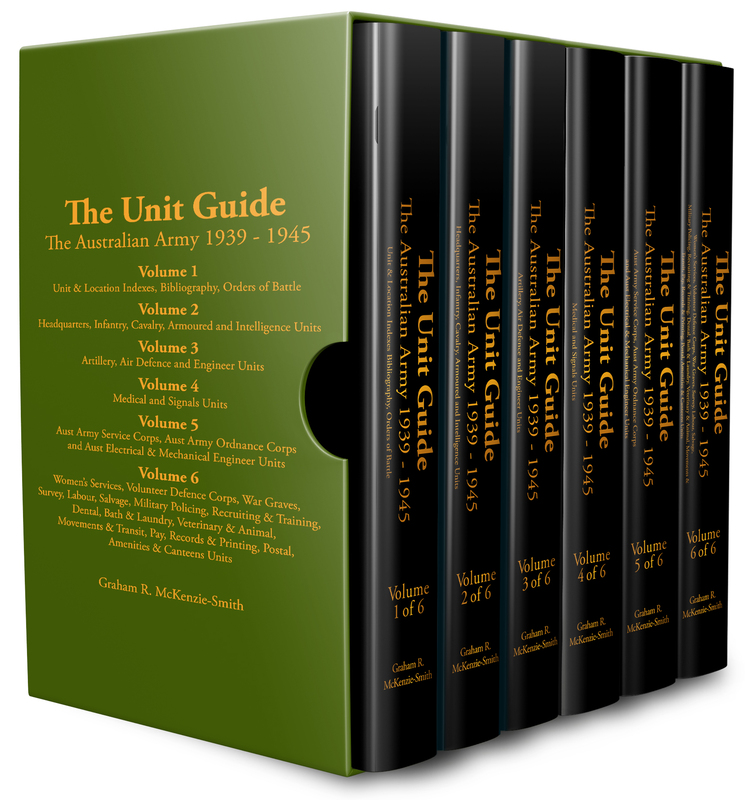 The Unit Guide consists of Volume 1, Unit & Location Index, Bibliography (of 620 Unit, Campaign and Local Histories), Index of Authors and Orders of Battle. Volumes 2 to 5 contain the Arms and Supporting Arms Units, whilst Volume 6 contains the smaller unit types, including Women’s Services, Volunteer Defence Corps, War Graves, Survey, Labour, Salvage, Military Policing, Recruitment & Training, Dental, Bath & Laundry, Veterinary and Animal, Movements & Transit, Pay, Records & Printing, Postal, and Amenities & Canteens. So how does it work? Firstly the reader refers to Volume 1, which provides two methods to search for a unit, or three if you only know a geographical location. The reader begins with searching for your selection from the 1,504 types of units in the Index to Unit Types, or if the unit name is known, consult the Unit Index of 13,700 entries. An example of a scenario, I know that ‘Grandad’ served as a Despatch Rider during the war in the Middle East and New Guinea, and I recall he mentioned he was in a ‘Z’ unit at one time. I consulted the Volume 1 index to unit types to find ‘Despatch Rider Sec’ on page 1.015, which in turn refers me to page 1.099 where I locate ‘Z’ Despatch Rider Sec (AIF), which then directs me to 4.504 (Vol 4 page 504). When 1 Aust Corps was recalled to Australia in early 1942, 4 DR Sec left a detachment at Gaza (Palestine) to form ‘Z’ DR Sec in February 1942 for the part of AIF (ME) Base Area Sigs that was to remain in the Middle East to support 9 Inf Div. They were renamed 11 DR Sec in May as part of the reorganised AIF (ME) Sigs. They moved to Kilo 89 in July and after the successful offensive at El Alamein, 9 Div Inf was withdrawn to Australia, with 11 DR Sec leaving the Middle East in February 1943. After leave, they moved to Balcombe (Vic) to join 1 Indep Sigs Gp and await reassignment. In August 1943 they were allocated to 19 L of C Sigs which was to take over the signals system along the north coast of New Guinea. They moved to Port Morseby (NG) in September to join 2 Coy, 18 L of C Sigs and after the capture of Lae, moved there in November to join 2 Coy, 19 L of C Sigs. Detachments also worked from Finschhafen, Nadzab, Yalu and Wau in 1944. Other detachments worked from Madang, Boram, and Jacquinot Bay in 1945, but 11 DR Sec remained based at Lae until the end of the war. The sample above provides a profile on the formation, designation changes, movements and re-assignments of a small unit that does not have its own unit history, and any researcher would find it extremely challenging to locate the information above without a great deal of angst. Graham has made it available at your fingertips with the turn of a few pages. As well presented as the deluxe bound books and fitted case are with the solid binding and the paper quality, this is the one area that detracts from such a fine work. Unknown to the author, a late decision saw a colour change of the case and volumes to a darker green and cover typeface revised to a bronze from the intended gold colour. This combination makes reading the text on the case and covers somewhat difficult in subdued natural light. This minor distraction does not diminish from the content, which one would otherwise be extremely hard-pressed to easily locate on the thousands of Australian Army Units from World War Two. This is a unique work as a single source of reference for the 5700 Army units that were raised during the Second Wold War, and the profile of every unit in such detail has never before been attempted. Graham McKenzie-Smith is to be congratulated on his latest contribution to Australia’s Military History. This latest work should not be underestimated and should be elevated alongside the most important published works on Australian involvement in World War Two. Every Ex-Service Organisation that deals with veterans, or their widows and dependants, educational institutions, libraries and military historian’s book shelves, would be poorer without this outstanding work.